Robotics isn’t a trending topic in the news much as it’s still an evolving technology with very little consumer applications. But once in awhile those institutions who are experimenting and refining the industry make progress that just needs to be seen. Boston Dynamics ATLAS Robot was first introduced July 2013 and as expected was not the most nimble of robots out there, but ATLAS offered a glimpse into what future robotics might be. Now over a year later with the help of the Florida Institute for Human & Machine Cognition, ATLAS has upped its game and gives us an impressive walking display in the YouTube video below. Its construction and development funded and overseen by the United States Defense Advanced Research Projects Agency (DARPA), the ATLAS robot is approximately 6 feet tall and weighs about 330 pounds. The ATLAS is made out of aircraft-grade titanium and aluminum with blue LED lights mounted inside its chest. The humanoid owes its agility and balance to an onboard computer that receives information from a laser rangefinder and stereo cameras that survey and gauge the robot’s immediate surroundings. 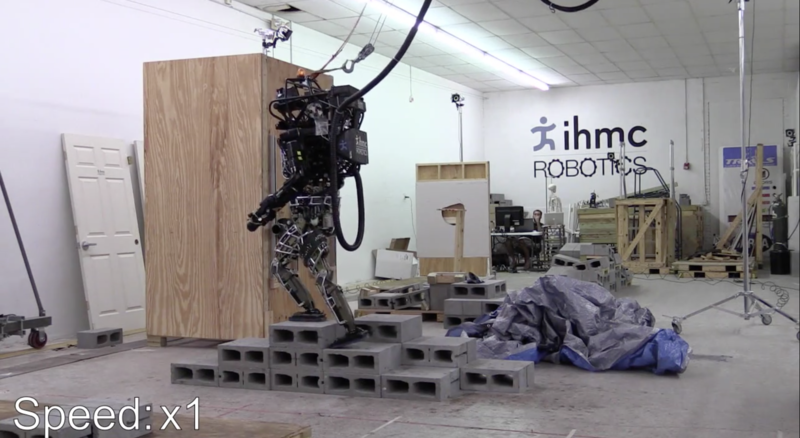 It’s pretty interesting to see how nimble ATLAS is in the video walking over the uneven blocks with ease. While the robot is still tethered to wires and cables this is still progress in robotics, we’re probably far off from Terminator style robotics (thankfully) but every new step is fun to watch. What do you think of ATLAS? Let us know in the comments below or on Google+, Facebook and Twitter.